If you’re pining for some sunshine, why not create some yourself by sharing a warm smile? Share a Smile Day is coming up on March 1, but you can get started now with these simple ideas. If we all work together, maybe we can bring on an early spring! Pay for the person behind you in the coffee line. Buy a package of note cards and write kind messages to friends or family and drop them in the mail. Pick up a bouquet of flowers and share them put them on display. Give someone a sincere compliment, something you’ve noticed but maybe never said. Write an email to a supervisor of someone who did a great job. Pick something bright and colorful to wear, even a crazy pair of socks. You’ll feel brighter and that brightness spreads. Ask someone to tell you about the thing they are most proud of, then listen. Invite friends over for a casual brunch. Think of a task your friend dreads and secretly do it for them. Slip a note of encouragement into your kid’s lunch box. Start an email chain with your friends asking for the funniest YouTube videos. When you see someone in military uniform, go up and thank them for their service and for their family’s sacrifice. Make a playlist of songs that make you smile and share it with your music-loving friends. Track down an old friend you’ve lost touch with and catch up. Make a donation to your favorite museum or charitable cause. Contact a local women’s shelter and ask about current needs, then organize a donation bin at work. Hold the door open on the elevator. Strike up a conversation with somebody new. When parking at a meter, feed a few extra coins into any nearby that are expiring soon. Think of someone from your past who influenced you and write them a letter. Take a walk outside and breathe in fresh air and invite a friend to join you. Break out the old home movies and watch them with the family. Visit an animal shelter and spend some time holding and petting the animals. Make your favorite “special occasion” meal just for fun. When reading, look for articles that would interest your friends and family and send them. 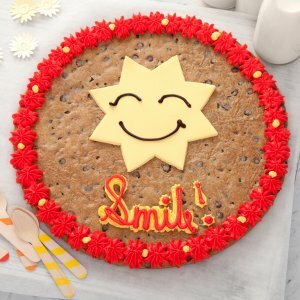 Of course, our favorite way to share a smile is with a fresh order of cookies from our Sunshine Collection. It’s practically impossible not to smile when you get an order of these. Do you have a favorite way to share a smile? Share your ideas in the comments or on our Facebook page.